Driver and Passenger safety – The Uber car inspection is the source and the start to make this happen. My one-year driving for Uber anniversary is coming up. Yeah, it’s only been a year and my life has changed like crazy – for the better – in just 12 months! No more boring day jobs, no more rigid schedules or irritating bosses (the last supervisor at my day job asked me if I could help him sign up to drive with Uber when I ran into him…go figure). And I actually spend my time working for something that I am excited about: making transportation more efficient, affordable and flexible, while being on my own schedule. Do the same and become an Uber driver as well! Sign up and get a referral bonus! Since it’s been one year I’ve been driving for Uber, my annual vehicle inspection is coming up and I’d like to share the experience with you. I get lots of questions like “how do I schedule an appointment with Uber to get my vehicle inspected?” or “where do I get my Uber car inspection to start driving?” So let’s shed some light on that. Where Can I Find Uber Car Inspection Stations? 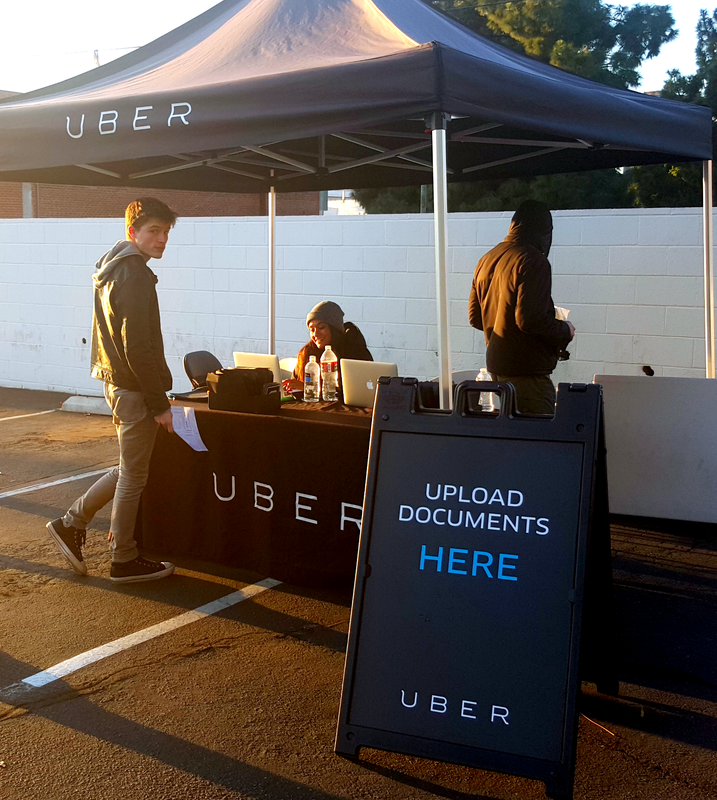 Los Angeles is now packed with Uber car inspection stations. When I started driving for Uber a year ago, there were only a fraction of the inspection stations they have today. I picked the station on 1633 Purdue Ave in West LA, about 15 minutes from where I live. The process itself is very simple: you just pull into an Uber car inspection station, park, register, get your vehicle inspected, upload the documents and you’re done. An Uber car inspection station is usually just a big parking lot with some tables and tents set up. It’s quite basic. If there are Uber activation centers in your city, they will be displayed on the page. What If There’s No Uber Car Inspection Station Close By? If there’s no official Uber car inspection station near where you are, no problem. You can get your car inspected by a third party. Make sure to bring the Official Uber Inspection Form with you. Option 1: Certain areas and Cities have negotiated a fixed price with participating mechanics. There’ll be a link to a list of participating locations on the page. Pricing is usually around $20 for a car inspection. 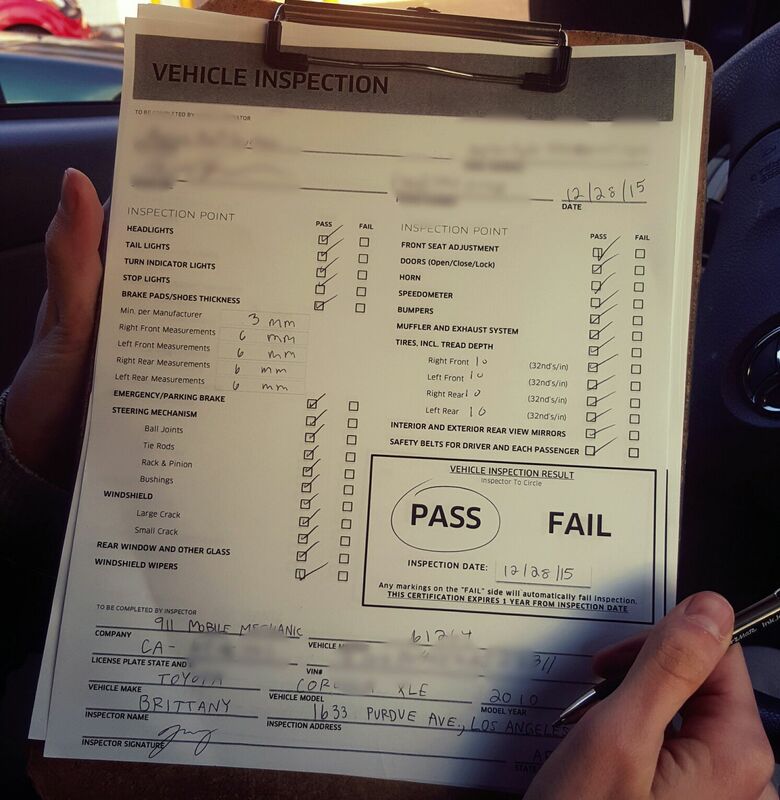 Option 2: Get your vehicle inspected at a BAR certified auto shop close to you. BAR means Bureau of Automotive Repair. Option 3: Uber is partnering with Your Mechanic. Your Mechanic is a service that comes to where you are. You’ll get a fixed upfront price, book an appointment, and then conveniently make your payment. The mechanic will come to your address, complete a full Uber vehicle inspection plus an oil change for $50. Here’s some basic info first regarding your upcoming Uber vehicle inspection: Uber has car inspection stations set up in most cities where Uber operates. See the list of different options to get your Uber vehicle inspection done above. When you bring your car to an Uber Activation Center, they’ll inspect it at no cost and usually pretty quickly while you’re waiting. In certain areas and cities, Uber pays a cash bonus when you get your first car inspection. What Are The Items On The Checklist? If the reason you’re not passing is minor, such as my brake light not working, they can put your car inspection on hold for the day, and pass you when you return the same day with the item(s) fixed. If you can’t get it fixed the same day, you’ll fail and have to do the inspection all over again. So I needed a new brake light. I just took off to the closest Autozone, got a new brake light bulb and they even put it in for me (no way I would have figured out how to do that…). So that’s done. Back at the Uber car inspection station, the inspector that started the process had already left. No problem, Brittany, the girl who took over for him, checked my brand new brake light and…I passed! is uber driver in Malaysia? I tried using your sign up referral as a driver, but it was not added to my account. How can I retroactively add your referral code? I did the inspection but I cant seem to find where to upolad the form to uber..How do I know if Uber got it and I can start driving? I read the foregoing article and found most of the contents very similar to the annual mechanical inspection system that is used here in the British isles, this a compulsory test that ALL vehicles are subject to, irrespective of the purpose for which they are used. The system ensures that, at least once every 12 months, the vehicle is thoroughly and carefully inspected against the manufacturers specifications. In the case of vehicles that are used as taxis, there are more stringent rules, for example, a car that has been maintained in an, “as new” condition, may still be used as a taxi/private-hire vehicle, but, having reached 10 or even more, years service, becomes subject to an inspection every 6 months. Likewise, our drivers, who are over a certain age, also have a twice-yearly medical examination,- A full ECG and the works! All is based on safety and common sense. Thus it should be possible for someone, aged 74 to use a Tesla sedan, or an electric, Honda, Volkswagen, Ford, whatever you will, as a taxi. interesting, don`t you think? I have a 2008 Dodge Ram 1500 Quadcab 4 door truck in good condition, but it has a 6 speed manual transmission (which many passengers find fascinating since most people have never driven a manual transmission). Would the fact that it is a truck or, that it is a 6 speed manual transmission, disqualify the vehicle? I could think of many reasons why a person wouldn’t want to ride in a full-sized pick-up or any truck for that matter. They are a lot more difficult to get in and out of for some people such as elderly or anyone with a disability. The number of passengers you’re allowed to drive is completely based on the number of seat belts in your vehicle – most are a total of 5, including the driver. Even if YOU claim you can seat six, you’d better make sure that’s the number of seat belts you have. I’ve been driving Uber for a year and never had to have a vehicle inspection. This is the midwest and the closest office is over an hour away so all we had to do was send in a photo. MUCH fewer restrictions in our area, thankfully. It’s not a 4×4 and there’s not any lift kit on it, so it’s a fairly comfortable entrance & exit…probably easier than a regular sedan or smaller vehicle? I have a dent in my passenger door. It doesnt look too bad- but it is there. Does that matter with Uber? In NJ where I live I cross over into Philadelphia..I need a placard for my car. I have requested one twice..still haven’t gotten one. There are 3 different placards and I can’t find which one(s) I need as I will be going to the international airport in Philly. Illegal to drive in PA without placard. Can someone tell me where I can find this info and NO it’s not on the Uber site that I can find. What is the Vehicle Inspection Receipt? I sent a copy of my paid receipt for the inspection – -thinking that was the most logical thing by that description — Uber sent it back and said — it was the wrong form. Does anyone know what the “Vehicle Inspection Receipt” is? or where to find a description of it- – I can’t seem to locate anything about it on Uber’s site. My car is in pretty good shape besides a somewhat minor scrape on the rear passenger side.. Will this fail my inspection? I just failed my inspection because there is a small crack on the passenger side of the front bumper cover. Notice I said bumper COVER. The bumper itself is fine, the plastic molding is what is damaged and in no way affects the safety integrity of the vehicle. I want to argue the “mechanic”s report. Does my argument hold water? My car is not allowed to get an inspection until October of next year. What am I suppose to do now? I have a Lexus RX 300 that is safe, well maintained and clean in every way except that it is a 2000 model. Is there any way around the 2001 or newer stipulation? I’m located in Utah County. I googled “Raiser inspection form tampa bay” and found the form on “tampabay.ubermovement.com”. I hope this helps you! where can I get the auto inspection form? My vehicle is a black cherokee patriot 2013 in good condition. Is this vehicle acceptable? I just bought a new 2017 Ford Escape. Why do I have to get a brand new car inspected? The Kentucky Inspection Form link is broken and I cannot find a way to contact them to let them know!? Is the form published someplace else? 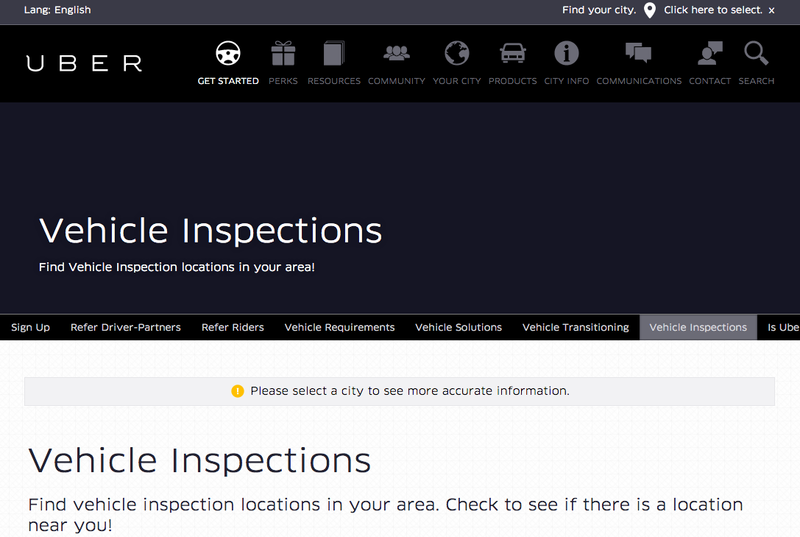 How can I find an inspection center for Uber? I have an auto repair shop, how can I become an Uber Activation Center so we can perform inspections for drivers? SOMEONE PLEASE POINT ME IN SOME DIRECTION!!!!!!!!! I am wondering the same thing . I would suggest calling Philadelphia city and ask the DMV. When I was a professional they are usually who provided taxi hard cards. If they can’t help you ask who might be able to help or contact the city and state offices as well.